Are You Old Enough for Inbound Marketing? The tech industry is known for inventing new names for existing things, mainly to promote their own company. Great for them, but bad for customers: there’s always so much confusion about these new terms (earlier I wrote about the confusion around Demand Generation and Sales 2.0). LinkedIn showed this poll to randomly selected marketing professionals who work in the Tech Industry. 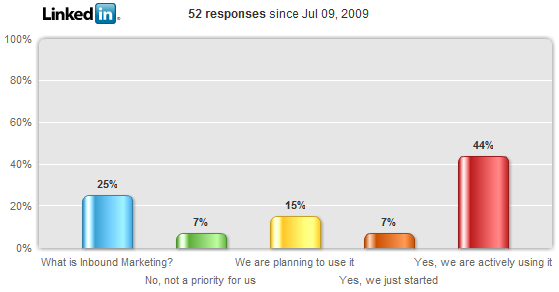 The overall results were pretty good: almost half of the respondents is already actively using Inbound Marketing. Although 25% has no idea what it is. The older the respondent, the more likely they are to know about and use Inbound Marketing. I though Inbound Marketing and Social Media would be a Generation Y thing! If you then zoom in on the job level of respondents, we find a likely explanation. “Older” usually means markers in senior positions. And senior marketing executives have a helicopter view: they may not know the details, but they are good at spotting new trends and taking advantage of them. I’d say “yes”. It clear that many B2B marketers know what it means, and many are already actively using it. Of course, the survey biased. LinkedIn users are more likely to know about Inbound Marketing than the average marketer, because LinkedIn is one of the Inbound Marketing tools. And people who don’t know what Inbound Marketing is could have simply skipped the poll. For me personally: this blog is mainly read by innovators, so I should be safe to use Inbound Marketing as a well-known term. What is your take? 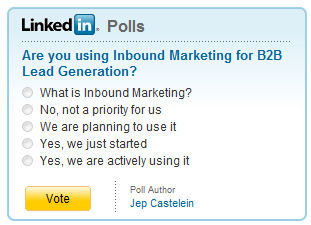 This entry was posted in Inbound Marketing and tagged inbound marketer, linkedin, market research, poll, survey on July 22, 2009 by Jep Castelein. In the last years I’ve done a lot of Search Engine Optimization (SEO) projects. What keeps surprising me is that most people think it’s some kind of black art. Basic SEO is actually quite straightforward: hence my 3 steps to SEO Success. Agreed: I had to simplify some things, so please don’t bash me on that. My goal is to expose the basic principles of SEO, not to provide a comprehensive cookbook. Side note: I mainly write about Marketing Automation, but I’ve come to believe that Inbound Marketing (which includes SEO) should go hand-in-hand with Marketing Automation. Inbound Marketing adds more leads to your database, and Marketing Automation manages those leads. All search engines have approximately the same approach: they rank based on relevant content and page popularity. Relevant content means that the keywords from the search query appear frequently on the page, and in the right places (Title, URL, Headings). Popularity means that many other sites link to this page, ideally using the same keywords in the link text. So let’s look at the 3 steps. To start, choose keywords that are relatively specific. “Web Portal Software” rather than “Business Software” and “Web application usability” rather than “usability”. This ensures that you have a reasonable chance of getting on page 1 of the search results, and that you attract the right audience. Later on you can optimize for more generic terms. Just to be sure, check if the search spiders can find your site. Type the following into the Gooogle search box: “cache:http://www.yoursite.com” without any spaces (click here for an example). You can use SEO Browser to see how Google sees your site: check that all content and links are visible in this text-only view. Do this for each page. For each of those pages, put the keywords in the TITLE, URL, H1/H2 and in the content itself (example: a page optimized for “SaaS Analytics“); in the URL, use dashes (“-“) to separate words; if your website doesn’t use <h1> and <h2> tags (do a ‘view source’ to find out), ask you web developer to add them. Add an ‘elevator pitch’ in the META description tag, so Google will display this as a summary on the results page. Example: search for ‘Good Data’ and Google shows a summary written by Good Data’s marketing team: “Good Data brings easy, flexible, affordable analytics within reach of every company”. Write appealing content, so other people want to link to it. Consider creating “link bait”: popular topic formats are “top 10 rules for…” or a list of blogs or Twitter accounts that cover your space. Always keep in mind: write about the interests of your target audience, rather than pushing your wares. Links (internal and external) should have descriptive link text. Use “business intelligence software” instead of “click here“. Google uses the link text to figure out what your page is about. If you have a blog, put it on the company domain (http://blog.company.com) and ask other bloggers to add your blog to their blogroll (and do the same for them). On your home page, include links to the keyword-optimized pages, so Google easily finds these pages (example: the links on bottom of Rightnow.com). The link text should be the same as the selected keywords. As you go through these steps you will find out what works for you. You should monitor the ranking for your selected keywords weekly or biweekly: just type it into the search engine and see if your site pops up. Then check your web analytics tool to see which keywords bring most traffic. If you monitor conversions (e.g. a whitepaper registration) you’ll see that some keywords convert better than others. Focus on link building for the keywords that work best for you, and keep adding new keywords. Also, as your ranking improves, you may take on more challenging keywords: the ones that are really popular. I hope this article was useful for you: let me know if you have question, or if you want to suggest changes to the approach I described. And keep up the optimization effort: it will take at least a couple of months before you start seeing results. This entry was posted in Search Engine Optimization and tagged Google, Google Keyword Tool, LeadSloth, Link building, SEM, SEO Browser, SEO Optimization on July 14, 2009 by Jep Castelein. In addition to the overview article that I linked to above, I’ve written one post for each step. Those will be published this week and next week. The first article about getting more website visitors is already live. I’ve heard other definitions of the steps that are more catchy, like “pre-click, post-click and post-conversion”. These are the same steps as my steps 1 to 3. I’ve chosen to write out a description of the steps, because I think that’s easier to understand for people who are new to Marketing Automation. And I’ve added step 4 because collaboration with sales is one of the key success factors of marketing automation. This entry was posted in Demand Generation and tagged genius.com, marketing automation on July 8, 2009 by Jep Castelein.